Summer programs are simple, home-grown and laid-back. Reservations for dinner at Buck’s Restaurant on Woodside Road will be made for 5:30p.m. The usual meeting site at Woodside Community Church down the road will be opened at 7 pm. We are giving Melanie a break for the summer, so bring something light to share, or a carton of lemonade. Tonight’s program will feature Ann McDonough sharing with us a fascinating class she took at CNCH this spring from Cameron Taylor-Brown. We will have a round table program for which everyone brings in various pieces of woven cloth collected from their travels, or even “cheap” dish towels from World Market — something interesting. In small groups, we’ll examine these fabrics for weave structure, what makes this cloth interesting (or not), fiber type, etc. 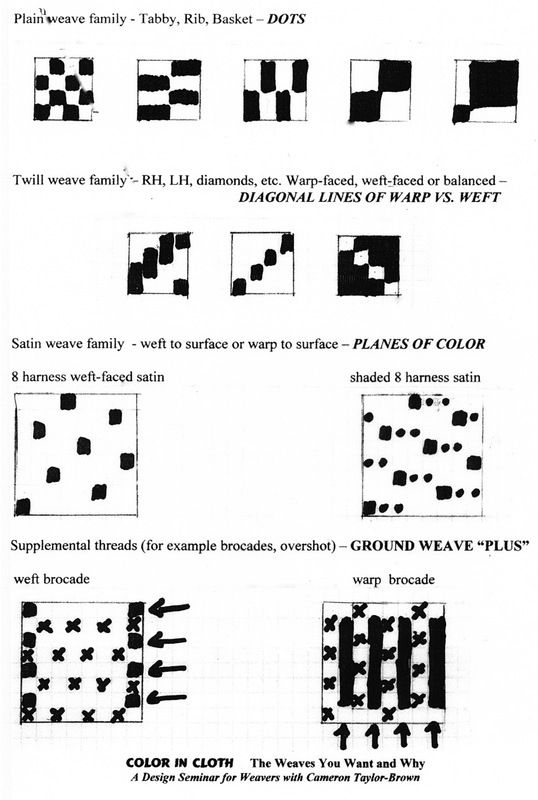 For example, in the study group at CNCH there was a cloth that was warp+weft ikat, another which was some sort of inlay. There was also a stitched double cloth. Try looking at Cameron’s website (www.CameronTaylor-Brown.com ) for ideas, if you want to bring something challenging (discussing any one of the fabrics on her site would take all night). You get the idea.